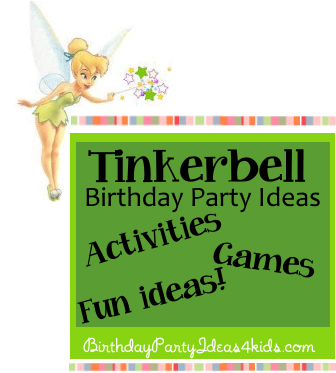 Fun ideas for a Tinkerbell themed birthday party. Have fun mixing and matching these Tinkerbell birthday party ideas for the perfect fairy party. Fun way to play tag with a twist. Tinkerbell holds a wand and tries to tag other players (gently) with the wand. When she does the player that has been tagged has to freeze in the position they were in when they were tagged and is unable to move until another player tags them. Just after the other player tags the frozen player both players must clap their hands and say " I believe in fairies" before they can run away. After Tinkerbell has frozen everyone she can pick the new Tinkerbell and the game starts again. You will need a very long piece of ribbon and a large ring. Put the ribbon through the ring and tie the ends of the ribbon together. Make sure the ring can move freely on the ribbon. Sit the party guests in a big circle and have them each hold a piece of the ribbon with both hands. The first Tinkerbell will stand in the middle of the circle and close her eyes, then she will slowly spin in a circle three times (this is to distract her from peeking). While Tinkerbell is turning in her circles the girls holding the ribbon will slide the ring from one girl to another. One girl will hide the ring in her hand while holding the ribbon. Tinkerbell then has 3 chances to guess which one of the fairies has her ring. If she chooses right the girl who is holding the ring trades places and becomes the new Tinkerbell. If she is wrong she has to close her eyes and start again. Inside invitations place a small amount of glitter - fairy dust! Send invitations wrapped in green netting and tied with a purple bow. Tinker bell Skirts - Here are easy no sew directions for making a Tinkerbell fairy skirt. Make them before the party or have everything ready and let the girls make their own. Or you can have half of them done and let the girls choose ribbon to tie onto the skirt. Here are directions for the fairy tutu's. Flower Pixie Pens - make a pretty pixie pen using pens or pencils, artificial flowers and florist tape. Buy several different kinds of artificial flowers that have long stems. Separate the flowers into individual stems. Let guests choose a flower and then tape it to the pen with florists tape going around and around the pen to cover all of the flower stem. Pixie Party Station - Have a Tinkerbell makeover station before the party begins. Spray on glitter hair spray (pixie dust), and let the guests apply glitter body lotion, face tattoos of Tinkerbell or sparkly eye shadow to get ready for the party. Buy fairy wings and star shaped wands to equip the guests to be fairies. Cover up the doorbell and place a sign outside the front door that says "Clap if you believe in fairies" - once they have shown they believe in fairies let them into the party. This is also fun to do if you will be bringing out the cake or when you bring out prizes for games. Outside the party entrance place large solid color pinwheels in the ground along the walkway to look like flowers. Purple, Green and Yellow are the traditional Tinkerbell colors. Decorate the party table with a green table cloth and sprinkle glitter or confetti on top - then cover with a clear plastic table cloth. Wrap green or purple tulle around party chairs and then secure with large bows tied in the back of the chair. Use large flower shapes paper plates and matching cups. Place colorful pinwheels in solid colors along the party table in small flower pots. Old fashioned lanterns are a great touch on the party table. Hang green and purple tulle across the party area and fill with artificial flowers and vines. Strings of lights can be hung around the party area, in plants and on the party table. Outside place helium balloons on the mailbox and hang flowers in the trees and bushes outside. Use a star shaped cookie cutter to cut out star shapes from brownies, large cookies or fruit. Use smaller star shaped cookie cutters and you can place a pretzel in the food and call it a fairy wand. Fairy Dust Marshmallows are pretty and perfect for a Tinkerbell party. Place a large marshmallow on a wooden skewer and dip in a little water. Then roll the marshmallow in colored sugar (fairy dust!) and place in a tall container.